The Sudipto Mundle Committee’s estimates of the national accounts (base 2011-12) going back to 1993-94 are welcome because they enable us to make comparisons of growth during the life of different governments using a consistent time series. The Union ministry of statistics and programme implementation has stated that the report has been released for comments and could undergo some changes. On the assumption that changes, if any, are going to be minor, I thought I would use this article to extract the big messages that emerge from the new series. The average growth rate achieved during different governments is summarized in the table. Since I want to focus on production and income generation, I will discuss the growth rates from the series on gross value added (GVA which is the old factor cost). The growth rates from the gross domestic product (GDP) at market prices series are also reported for those interested. The Atal Bihari Vajpayee government gave us an average annual growth rate of about 5.83%. Manmohan Singh’s United Progressive Alliance (UPA) I delivered a stupendous average of 8.86%, which fell to 7.39% in UPA II. The 10-year average for UPA I and 2 is 8.2%. The average for the first four years of the Narendra Modi government is 7.22%, which is lower than UPA II. Growth projections for the current year vary from 7.3% to 7.5%. However, even if we get 7.5% growth, the five-year average of the Modi government will still be only 7.3%. To equal the UPA II performance, growth in the current year would have to rise to 8.1%. This does not seem likely. The government can claim that 7.3% is not bad, given how the rest of the world is faring. However, it is well below the acche din that were promised. The Economic Survey of 2014-15 had said that the economy was now well-placed to go back to 8-10% growth. Subsequently, government spokespersons lowered the bar to “8 plus percent", but we are not there yet. Since employment expectations are linked to GDP growth performance, the reduced growth prospects raise legitimate questions about employment prospects. The growth rate of almost 8.9% achieved in UPA I (8.4% under the old series) was truly spectacular. It included a three-year run of 9.8% in 2005-06, 10.1% in 2006-07, and 9.8% in 2007-08. The UPA’s national common minimum programme published in 2004 had called for a range of 7-8% growth. Since the economy exceeded this target in the early years of UPA I, the 11th Plan GDP growth target was fixed at 9%. The new series shows that the growth achieved in the Plan period (2007-08 to 2011-12) was 8.5%. It is a pity that with the abandonment of planning, we have also stopped setting growth targets. They do help to focus the mind and also set some yardsticks by which to measure achievements. Perhaps the seven-year agenda on which the NITI Aayog was asked to work will also set a medium-term growth target. Critics of the UPA have argued that the high growth in the UPA period was just a reflection of the buoyancy in the world economy and of the reforms introduced by the Vajpayee government, and not due to any reforms introduced by the UPA. How do these arguments stack up against the facts? The global environment was indeed buoyant. The International Monetary Fund’s (IMF’s) World Economic Outlook database shows that the world economy grew at 3.4% in the six years of the Vajpayee regime and accelerated to 4.8% during UPA I. However, the Indian economy, using the same IMF data, accelerated at a much faster pace from 5.9% in the first period to 8% in the second. The IMF data have not been updated to include the new series. When they are, India’s acceleration will be even faster. It is sometimes said that the high growth period began in the last year of the Vajpayee regime. The new series shows that growth in the last year of the Vajpayee government, 2003-04, was 8.2%. However, this was a rebound from the abnormally depressed level of GDP in 2002-03. There was a monsoon failure in 2002 and agriculture GDP declined by about 6.6%, leading to overall GDP growth of only 3.8%. Had agriculture been normal, the base year GDP would have been higher. Growth in 2003-04 over a normal base would have been only a little over 6%. 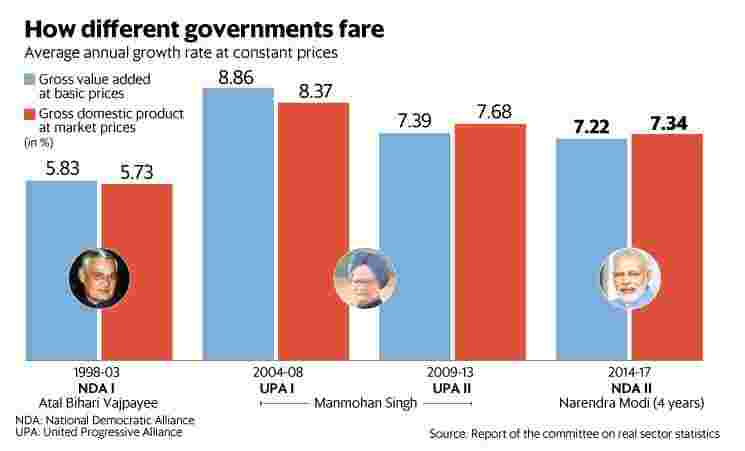 The growth rate in the first year of UPA I was 7.1%—respectable but not spectacular. The real growth take-off began with the 9.8% growth in 2005-06, and this continued until it was slowed down by the global crisis. The notion that the high growth under the UPA was only the consequence of reforms undertaken by the previous government is not credible. I have no doubt that the economic reforms which began in 1991, and were continued by both the short-lived United Front government and the much longer lived National Democratic Alliance 1 government under Vajpayee, created a favourable environment for acceleration in growth. The Vajpayee government’s explicit signals of continuity on economic policy, especially the commitment to openness to foreign trade and foreign investment, did help to reassure foreign investors that the reforms initiated by the Congress-led government in 1991 were there to stay. The UPA’s own policies successfully built on these favourable preconditions. The high growth under UPA was led by a remarkable expansion in the rate of investment. Gross fixed capital formation as a percentage of GDP shot up from 29% in the last year of the Vajpayee regime to 35.9% in the last year of UPA I. This investment boom was in large part because of the policies of the UPA government. The acceptance of fiscal discipline under the Fiscal Responsibility and Budget Management Act which led to a remarkable reduction in the fiscal deficit in the first four years of the UPA was a major factor in releasing resources for private investment. Paradoxically, the reversal of the fiscal stance to a fiscal stimulus in 2008-09 and 2009-10 was equally important. The world was teetering on the brink of a recession in 2008 and a switch from fiscal consolidation to fiscal stimulus was precisely the right thing to do in those circumstances. One can argue about whether the stimulus went on for too long. I personally think it did, and that is a lesson to reflect upon in hindsight. It does not negate the positive role of macro policy in the first seven years. There were many other policies that created a pro-investment environment. Foreign investment in aviation and telecommunications was significantly liberalized in the very first year. The government also committed itself to do the same in insurance. It was not able to deliver on insurance, because of opposition from the left and the Bharatiya Janata Party (BJP), but investors gave credit for the intention and hoped it would get done. The UPA government also withdrew Press Note 18 which was a long-standing irritant for foreign investors. It was introduced by the Vajpayee government in 1998 to respond to pressure from industry to prevent foreign partners in joint ventures, where they were restricted to a 40% stake (under the pre-1991 rules), from setting up a new business with a majority stake in the same area, which was allowed after 1991. The UPA government also made substantial progress in reducing customs duties to bring them closer to Association of Southeast Asian Nations levels. It also signalled its commitment to tax reforms by announcing in 2007 the decision to introduce a goods and services tax (GST). The preparatory work for introducing a GST was all done by the UPA. It is a different matter that the Bill was opposed by the BJP, and could not be passed. As in the case of foreign direct investment (FDI) in insurance, investors at the time recognized it as a commitment to reform, and assumed that it would happen soon. The results of these significant initiatives can be seen in the trends in FDI inflows. From $4.3 billion in the last year of the Vajpayee regime, FDI increased steadily to reach $41.7 billion in the last year of UPA I! Another worrying sign is that fixed investment by the household sector has declined continuously from 15.7% of GDP in 2011-12 to 9.1% in 2016-17. The investment rate in the public sector is flat at about 7%, and the private corporate sector even shows a modest increase in the last two years. Fixed investment by the household sector includes investments by farmers on their farms and by small businesses, including those in the informal sector, and also investments in real estate by households. A drop of 6.6 percentage points of GDP for this category of investments suggests that farmers and small industry face weakened growth prospects. Since this is also the sector that is most likely to generate non-agricultural employment, there is good reason to worry. To summarize, the new series does not suggest that we are on course for an early return to inclusive 8% growth. The employment prospects are especially worrying. Montek Singh Ahluwalia was the deputy chairman of the erstwhile Planning Commission.